T4A GPS Maps are a set of 16 regional GPS maps covering most parts of the African continent. If you are a tourist or business traveller and looking for a GPS map to guide you through Africa then you would appreciate the accuracy and detail of T4A GPS Maps. 2Gb Micro SD card with Standard Adapter. T4A GPS Maps are already loaded onto the SD card, simply insert the card into your compatible Garmin GPS and start to navigate. Install files for PC and Mac users are also included on the SD card. If your GPS does not use an SD card, simply install the maps onto your computer and transfer to your GPS. You will need Mapsource or BaseCamp from Garmin to do this. T4A Africa Guide is preloaded and ready to use on compatible devices. This product contains contact details, rates, activities, facilities and photos for selected points on our maps. T4A Road Warnings are preloaded and ready to use on compatible devices. Routable coverage: South Africa, Namibia, Botswana, Angola, Lesotho, Swaziland, Mozambique, Malawi, Zambia, Zimbabwe, Kenya, Tanzania, Rwanda, Burundi, Uganda, Ethiopia, Sudan, Egypt, Morocco and West Africa. Non-routable coverage: Classic overland routes via North Africa - Tunisia, Libya etc. Prerequisites: This map is compatible with Garmin map capable GPS units only. You require a copy of Mapsource or BaseCamp to view this map on your computer and to perform route planning. T4A Road Warnings are Custom POI Alerts for compatible units only. T4A maps are constructed from GPS data sourced from the T4A Community of travellers. People just like you who record their travel experience and share it with the community via our maps. Tracks4Africa collects, catalogue and process these data submissions in order to create a very reliable GPS map. They link a name of a data contributor to a place or a road and this gives our maps integrity. The uniquely African GPS maps are routable in most parts of Africa and can in fact give you turn-by-turn directions from Cape to Cairo. Do not expect complete wall to wall coverage from the maps. 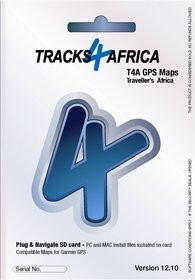 T4A only map places that are relevant to travellers and endeavour to construct the safest routable GPS maps in Africa. They have the most comprehensive and accurate list of protected areas in Africa and support the Mapa project in order to keep this resource the most relevant and accurate inventory of conservation areas in Africa. T4A GPS Maps will take you to the most incredible places on the African continent and boast a very comprehensive set of tourist destinations. Be it the Ngorongoro Crater or Gorilla trekking in Rwanda or simply a very good restaurant in Cape Town you are after, they have them mapped. They have an incredibly rich set of points of interest which is absolutely relevant to the independent traveller in Africa. The maps cover more than 85,000 points of interest ranging from activities, attractions to fuel stops and emergency services. They have accommodation such as hotels, guest lodges, backpackers as well as the most comprehensive listing of camp sites in Africa. For each point of interest they have a little landing page on Padkos where people can share photos and details about these places. Release Dates: T4A GPS Maps are released twice a year in May and October. The release number of the map corresponds with the release date. For instance, version 10.10 would be released 2010 October and version 11.05 would be released 2011 May. 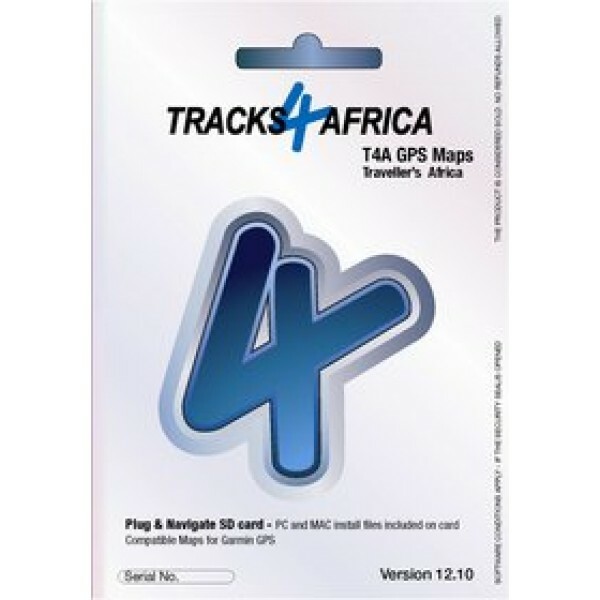 Free Upgrade: When you purchase Tracks4Africa maps, you are entitled to a once-off free upgrade download link.This upgrade will be for the very next release following the one you have purchased and is not transferable. This would mean that if you buy version 10.10, then you would receive version 11.05 links free of charge. Compatible GPS Devices: T4A GPS Maps are compatible with Garmin map capable GPS devices only. StreetPilot series not supported (SD Card and download links). Garmin users: Please note that Garmin users must have MapSource or BaseCamp in order to view or load T4A GPS Maps to their devices. The T4A Map is a GPS map constructed by travellers for travellers, people who are serious about travel safety and even more serious about their environment.